In the practice of the present-day type designer there is quite some emphasis on technical matters. Actually, this emphasis was also already the case more than 500 years ago. For the production of roman type in Renaissance Italy, Humanistic handwriting was adapted to a ﬁxed standardized and even unitized system for the production of textura type that was developed by Gutenberg and his peers (see also: www.lettermodel.org). During this presentation the question of how patterns distilled from Renaissance archetypal models can be used for the analysis and parameterization of digital type-design processes will be addressed. 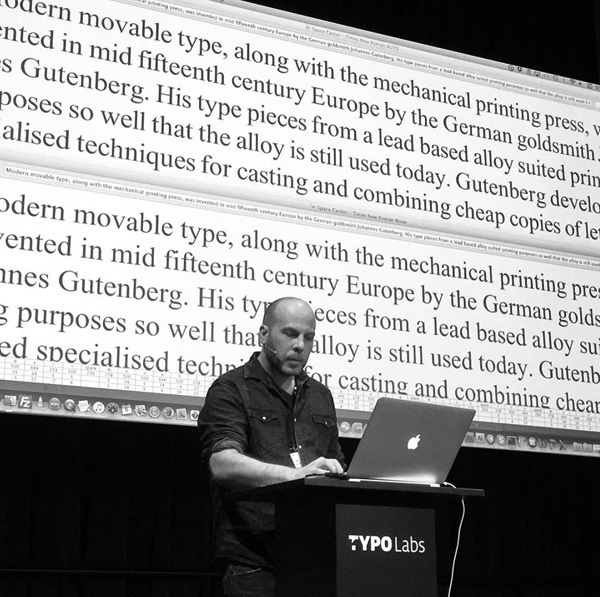 Outcomes of Blokland’s PhD research at Leiden University have been translated into software for auto spacing that is based on the intrinsic underlying patterning in roman and italic type. This software can be used to replace optical spacing completely or it can be applied supplementally to spacing by eye. Lukas Schneider demonstrates the LS Cadencer and the related LS Cadenculator, which are (batch) auto-spacing tools written by him in Python. The recording of this presentation can be watched here. The tools can be used as extensions in Glyphs App and RoboFont and can be purchased from the Revolver Type webstore.